C & A Scientific - Premiere C & A Scientific Premiere SMJ-03 Binocular Stereo Microscope, 10x Eyepieces, 30x Magnification, 3x Objective, Upper Halogen Illumination. The C & A Scientific Premiere SMJ-03 binocular stereo microscope has 10x widefield eyepieces, 3x objective with 30x total optical magnification, upper 10W halogen lighting, a fixed stage with dual focusing knobs and a reversible (black/white) 60mm stage plate. The binocular viewing head has a pair of eyepieces, fixed inclination to reduce eye and neck strain, and eye shields to block ambient light. The objective provides low magnification and a longer focal length for inspecting large-scale specimens, or specimens that require hands-on manipulation or repair, including rocks, minerals, watches, or circuit boards. Dioptric adjustment accommodates individual eye-strength differences. The microscope has upper (episcopic) illumination that reflects light off the specimen for enhanced visibility of opaque specimens. The halogen light source provides bright light in a concentrated path. The reversible black and white stage plate is used with top-mounted (episcopic) lighting to provide contrast with light- and dark-colored specimens. The fixed stage has stage clips to secure the slide or specimen in place while viewing. Dual knobs provide precise focus. A stereo microscope, sometimes called an inspection or dissection microscope, has a longer working distance that enables users to manipulate the object being inspected, and is used in semiconductor and electronics industries or by mineralogists, dentists, and students when the user needs to handle or perform work under magnification, including circuit boards, rocks and gems, and dental appliances. 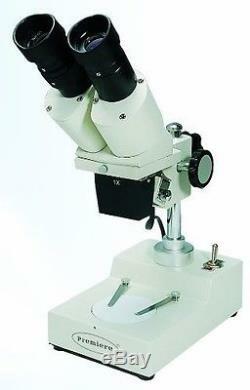 The microscope stand is constructed of metal for durability. The microscope is approximately 12 x 4-1/2 x 7 inches (H x W x D, where H is height, the vertical distance from the lowest to highest point; W is width, the horizontal distance from left to right; and D is depth, the horizontal distance from front to back). It comes with a vinyl dust cover and a spare bulb. Microscope Head and Optics Specifications. 3x, 6.7mm field of view. Microscope Illumination and Stage Specifications. Halogen with on/off switch, 10W. Fixed, reversible (black/white) 60mm stage plate, two stage clips. 12 x 4-1/2 x 7 inches (H x W x D). Microscopes are instruments used to enhance the resolution of an object or image. The company, founded in 1988, is headquartered in Manassas, VA. What's in the Box? C & A Scientific Premiere SMJ-03 microscope. Binocular head, pair of 10x widefield eyepieces, 45-degree vertical inclination to reduce eye and neck strain, and dioptric adjustment to accommodate eye strength differences. 3x objective, 6.7mm field of view, 30x magnification, and longer focal length for inspecting large-scale specimens. Fixed stage, dual focusing knobs, and reversible (black/white) 60mm stage plate with clips for holding samples. Product Dimensions: Width: 10.50 Length: 13.10 Height: 6.10. T be surprised if the mailman delivers your package within just a few days! If there is any problem we will gladly accept the return. Since we will always try to fix whatever problem occurs, we would also appreciate it if you don? We are always looking for the best suppliers, in order to provide our customers with the highest quality items and best deals to be found on the internet. As much as our customers love our items and service, we? Re always open to suggestions on how to improve things: if there? S something you think we could be doing better, then don? T hesitate to let us know. The item "C & A Scientific Premiere C & A Scientific Premiere SMJ-03 Binocular Stereo" is in sale since Saturday, February 18, 2017. This item is in the category "Business & Industrial\Healthcare, Lab & Life Science\Lab Equipment\Microscopes". The seller is "universe-deals" and is located in USA. This item can be shipped to United States, to Canada, to United Kingdom, to China, to Germany, to Japan, to France, to Australia, DK, RO, SK, BG, CZ, FI, HU, LV, LT, MT, EE, GR, CY, SI, SE, KR, ID, to Taiwan, ZA, TH, to Belgium, to Hong Kong, to Ireland, to Netherlands, PL, to Italy, to Austria, IL, to New Zealand, PH, SG, to Switzerland, NO, SA, UA, AE, QA, KW, BH, HR, MY, CL, CO, CR, DO, PA, TT, GT, SV, HN, JM.